Rathfriland YFC began in the late 1940s with a small group of like-minded people striving to provide a community hub for young people in the town. From that time, the club has seen many generations passing through the doors, creating a wide network of support throughout the surrounding area. 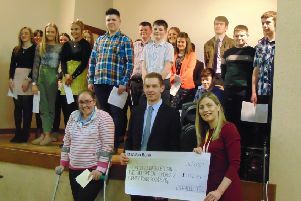 Without such support, Rathfriland YFC would not be as successful as it is today and members are very grateful to those who avidly attend and participate in events. One of the best events in the club calendar was the three act play held each year at their old club hall on Newry Street, Rathfriland. Since the move to Downpatrick Street, this has taken a backseat. However, in February this year, Rathfriland YFC took to the stage with Widows Paradise by Sam Cree. After a six year break, what a reception they received! It truly is a testament to what the club is all about… fun, frolics and a community atmosphere throughout. Since then the club has hosted their annual treasure hunt and barbecue, a fashion show with all the latest style from Martha Jane, Rathfriland, S M Shoes, Rathfriland and Amelia Jane, Kilkeel. This to name only a few events. However, as the school year began in September, so did a busy year for Rathfriland YFC as they kick started their winter programme with new members night. The evening saw over 20 new members joining the club and embark on new activities, making new friends and becoming part of the best rural youth organisation in Northern Ireland. Recently, club meetings have consisted of a range of activities such as pumpkin carving, a roller disco, competition practice and a junior social by Embrace Socials. On the run up to Christmas, Rathfriland YFC are looking forward to carols by candlelight on Friday, December 14th. Rathfriland YFC would like to wish everyone a safe and happy festive period.